Completely fed up with the junk being sold by various Mini vendors, I had a chat with my mates Graham Russell and Nick Swift - both I knew were suffering the same issues and running very short on good used original genuine Rover adjuster screws. We discussed the rubbish variable pitch/cut threads, non-spherical balls which tended to have high-spots on them, and breakages because of incorrect and/or inconsistent heat treatment. 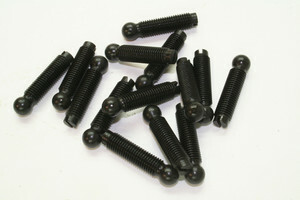 Hence I took the plunge to have top quality adjuster screws manufactured here in the UK. Knowing they were not going to be cheap as chips like all the others, I did know they would be the best quality, essential for fit, longevity of service and perhaps most importantly not prone to failure that can cause very expensive damage to other components. So - here they are. Adjuster screws that have a correct, full length thread, a properly spherical ball, Tuftrided for long service life. Thread is 5/16-inch UNF and priced each.